Members of the Napanee Parkinson Support Group take part in the second annual Parkinson's SuperWalk. Photo by Adam Prudhomme. 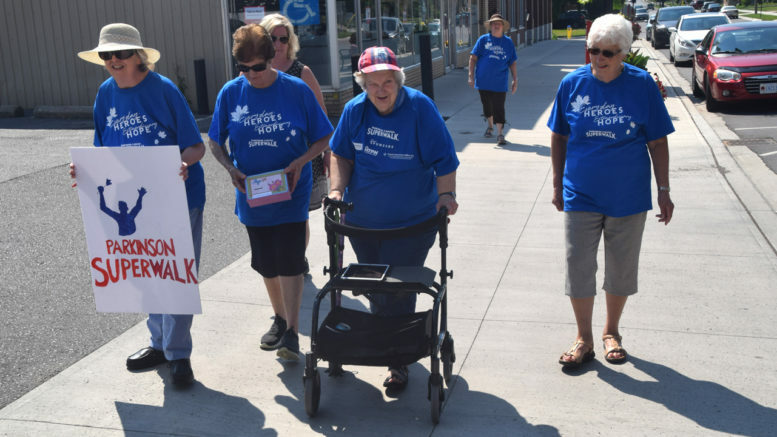 A crowd of blue shirts could be seen strolling through downtown Napanee last Wednesday, signifying the second annual Napanee Parkinson’s SuperWalk. About 10 walkers departed the Napanee Area Community Health Centre that afternoon, making a trip along Dundas Street and then back again. An early count of pledges revealed they had raised $2,274.25, with more money still being totalled. Money raised will go to Parkinson’s Canada to held fund research as doctors search for a cure. Just as important as the money raised, is the awareness the walk brings around the local Napanee Parkinson’s Support Group, which meets once a month at the NACHC. There’s no fee or obligation involved with joining the group. It’s run as a drop in event which regularly features guest speakers. It’s also a place for families to share their experiences and answer questions from people recently diagnosed with the neurological disease. An example of that is how members have noted that those willing to make the trip to Ottawa can often get seen by a doctor much quicker than waiting in Kingston. Members also discuss different treatments and devices, such as a medical pump that can deliver medication throughout the day into the bloodstream. “Lots of interesting information can be had by coming here,” said Robertson. The support group meets the first Wednesday of every month at the NACHC, located at 26 Dundas St. W. at 1:30 p.m. The Napanee SuperWalk is one of many that will take place throughout Canada during the month of September. Anyone interested in supporting the cause can go to www.SuperWalk.ca.